Highlight: Scored his first and second goals for the Wanderers against Newcastle Jets in Round 25 of A-League season 2016/17. Description: A tall central defender who has spent the majority of his career in Australia, with 6 seasons at Adelaide United. Despite being born English, he has won 6 caps for the Australian national team. 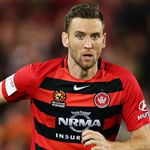 After a rusty start to his Wanderers career, he combined with Jonathan Aspro as a solid if not spectacular central defensive pairing in the second half of season 2016/17. Has retired from pro football halfway through his Malaysian deal. Might end up doing NPL stuff in Queensland. Is that the one where we were probably lucky it was pre Var? Does "Retired" 100% mean retired, or might the next thing we hear be that he has signed with Glory? He had strongly indicated he would be retiring end of season when still at Wanderers. Family doesn't live in NSW and he was retiring/returning to the family home. Thwaite's family is in QLD. Corny is originally from Adelaide. Gombau "not the right person at the right club at the right time", a nice guy who "rubbed people the wrong way from the first day he arrived". Who would have thought? Go Delhi! Sounds like we are missing out big time. Makes you wonder what we could have achieved under Gombau with a full preseason under the belt. But then again, he'd probably have to assemble his own squad first for the magic formula to work. Well, good luck to him, and them.